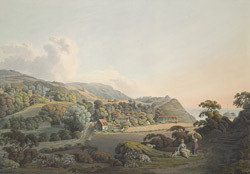 View by S. Barth, of a cottage at Steephill on the Isle of Wight. It is thought that this cottage belonged to the Governor of the island. Sir Richard Worsley wrote of this area in his book ‘The History of the isle of Wight’, published in 1781; “The small village of Steephill, is situated at the southern extremity of the parish, under the cliffs. The singularity of the situation tempted Mr Stanley, soon after he became Governor of the Isle of Wight, to build a cottage there, which is admirably contrived and most elegantly laid out”.